Hydrangea identification involves an eye to detail. Look at the leaves: how large are they, and what is their shape and color? Hydrangea varieties differ in leaf hue and texture. The flower color and appearance can be quite different as well. Is it a vine? The climbing hydrangea foliage looks very different from its cousins. You might not recognize the oak-shaped leaf of the oakleaf hydrangea until you glimpse the conical flower shape (panicle) that is similar to the pee gee hydrangea in a neighbor's yard. Once you get the differences in your mind, you'll be able to associate names with plants. Check to see the size, color and texture of the leaf. Bigleaf hydrangeas (Hydrangea macrophylla) have dark green, glossy leaves that, as the name suggests, are large and substantial. Look at the flower shape. Bigleafs can be mopheads with heavy round flowers or lacecaps, which are flat in the center with a ring of petals on the outside. Sandra Mason writing for the University of Illinois Extension describes them as having "bewildering beauty," perhaps because the colors and flower size can be so stunning. They come in colors that run the gamut from pink, purple and blue. Check the leaf again if you're sure that the plant is not one of the bigleaf hydrangeas. If it is similar to a bigleaf, but the leaves are not as substantial and have less rigidity, it may be a smooth hydrangea variety (Hydrangea arborescens). 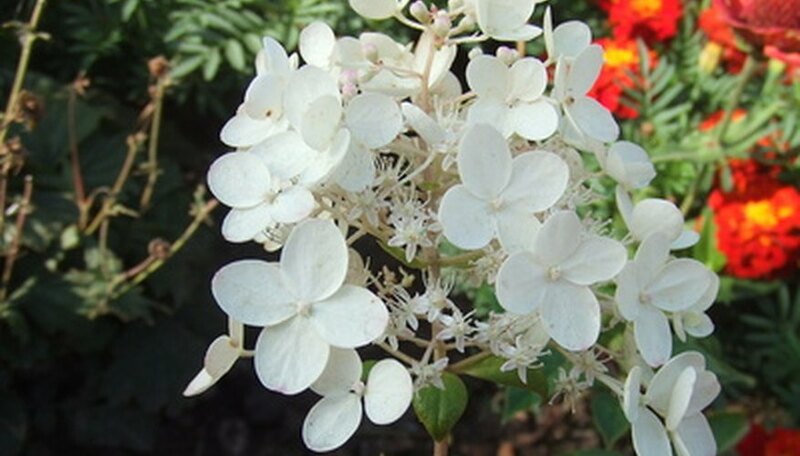 "Annabelle" is a well-known variety, often called the "snowball" hydrangea, according to Judith King of the hydrangeashydrangeas website. The leaves are heart-shaped and the mophead blooms open green, turn white and then back to green. If you're a little confused by the oak-leaf shape, don't be. If the oakleaf hydrangea (Hydrangea quercifolia) is flowering, you'll know you're not looking at an immature shade tree. Michele Brown writing for the Cobb County Extension Service in Georgia describes the panicles as 12 to 14 inches long and the flower color starting out white and fading to pink. If it's a pee gee hydrangea (Hydrangea paniculata), the leaves will be smaller and "rougher" and have a signature attribute of three leaves around a stem node, according to Judith King. The flowers are panicles as well, starting out white and fading to pink. This hydrangea is the only one that can be in a tree form, but it must be trained. Look at the plant overall. The climbing hydrangea (Hydrangea anomala), for example, is a vine with small glossy green leaves and has large white flowers similar to a lacecap. It self-attaches to a wall or tree and can have a wide spread. Don't be confused by the differences of pink or blue of the bigleaf hydrangeas as this reflects the alkalinity (pink) or the acidity (blue) in the soil. Use lime or aluminum sulfate for desired affect. See Michele Brown's suggestions in the Walter Reeve's article for applications for desired effect. Read labels of any product before applying. Bigleaf hydrangeas bloom on old wood and should be pruned only right after flowering. Oakleaf hydrangea flowers later than the bigleaf. It rarely needs pruning, but if it does, prune after flowering. Smooth hydrangeas and pee gee flower on new wood. Take out dead sticks but not live stems from your bigleaf hydrangea in the spring, to preserve buds. Do not overtreat bigleaf hydrangea with aluminum sulfate as this will keep the plant from growing, according to Sandra Mason. 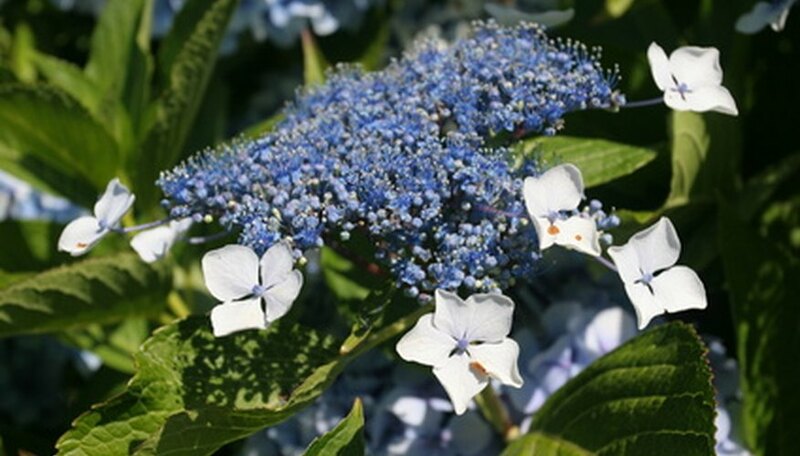 Judith King recommends buying "Annabelle" only when it is in flower, as sometimes plants are mistakenly labeled and the flowers are lacecap and look more like the wild hydrangea.